This lakeside campsite in Pavna offers you a couple of days in the midst of nature, a cheerful BBQ around a campfire at night, and comfortable tents in the night. In the morning, you'll wake up to the sight of the Pavna Lake in the misty morning light. At this campsite, you can relax, read a book, go for a walk, or head to the lake to get your toes wet. If you're up for it, you can also ask for a guided trek (at an extra cost) to Tikona Fort or Bedse caves. 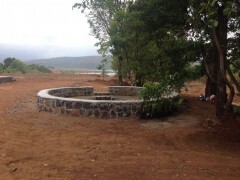 Pavna lake is a serene lake that is about 2-3 hours away from Mumbai, and has become a popular picnic spot. Formed by the dam built on the Pavna river, Pavna Lake is very beautiful, with greenery all around its perimeter and views of the hills all around. Your campsite lies in the lovely Thakursai Village. 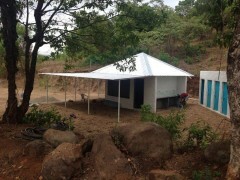 You will be staying in sturdy Coleman or Quechua tents. 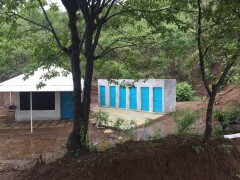 The campsite boasts several amenities, such as clean Western and Indian style toilets, as well as indoor and outdoor showers. Your entire campsite has electricity and 6 charging stations to charge mobile phones. Your meals will be prepared with organic ingredients in the local style by the resident chef. • Book a camping trip in Pavna. • Unwind in this idyllic escape from city life. • Inhale fresh air in the lap of nature. • Dip your feet in Pavna Lake. • Enjoy delicious meals prepared from organic produce. • Make many new friends. • Enjoy a BBQ and campfire session, and go to sleep in tents. This is a non-strenuous activity, and is suitable for anyone. However if you have cardiac or respiratory problems, or have knee or spine problems, please check with your doctor before booking this lakeside camping trip in Pavna. All-male groups are not allowed to book this trip. Littering is not permitted on camp premises. Camp equipment should be treated with respect. Alcohol not sold or provided by operator, but you can carry your own. There is no cancellation or refund policy for any confirmed bookings for the lakeside camping trip in Pavna. Charges for children under 12 is INR 1250. Surcharge for a dog or cat is INR 500. Pets must be kept on a leash at all times. Carry food and a water bowl for pets separately. Pets are not allowed in the tents. Swimming in the lake is banned by the Pavna Dam authority. Swimming in the lake is at your own risk. Trek guides can be hired for INR 300. Check in time is 16:00 and check out time is 11:00. 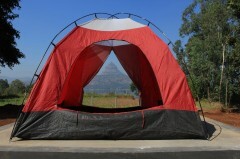 The operator is not responsible for any loss of property, injuries, accidents, or mishaps that occur at the campsite. You can check in to your campsite in Pavna by 16:00 hrs in the afternoon, and will be shown to your tents. You'll be served an evening snack of bhajias with tea or coffee. After that, you can relax at camp or go to the lake to watch the sun set. Once it grows dark, a campfire is lit, and you'll enjoy unlimited BBQ items with your gang. Wind up your day with a delicious local style dinner before retreating into your tents for the night. Check in to your campsite. Wake up to a glorious sunrise amidst the peaceful surroundings of nature. You can do some yoga stretches or meditate in the serene surroundings before breakfast. After a delicious breakfast, pack up and check out of the campsite by 11:00 hrs. Your trip ends here. 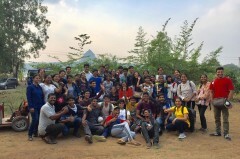 Check out after a fun Pavna getaway. Stay in spacious, comfortable alpine tents. You'll wake up to a breakfast of tea/coffee, poha, boiled eggs, jam, butter, bread, chocos and milk. After that, it's time to check out. Trip ends here. Eat your meals in this delightful dining area. 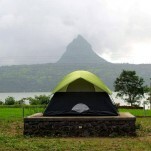 Located 2 and a half hours from Mumbai, 1 hour from Pune, and only 30 minutes from Lonavla, this Pavna campsite is in Thakursai Village. You can get to it via the Thakursai-Aajiwali Road.